In 1561, a Spanish conquistador claimed a dusty chunk of western Argentina and designated a plot for a vineyard. In 2000, an Argentine wine was picked as the best offering by five British connoisseurs in a blind tasting at London’s Dorchester Hotel. The route between those two events, reveals American journalist Ian Mount in “The Vineyard at the End of the World,” has as many switchbacks as an Andean trail. Mount’s account of Argentina’s wine industry is actually two stories in one: the country’s development of wine and, a few centuries later, its realization that the stuff wasn’t any good. Argentina was founded by Spaniards, but the immigration surge that transformed the nation in the 19th century was almost half-Italian. These newcomers began what was to become Argentina’s modern wine industry, and their preference was for simple table wine. It was produced cheaply, quickly and sometimes unhygienically — “as if the system were designed to make the wine bad,” Mount writes. That didn’t matter much, since Argentina’s high tariffs, political instability and frequent currency crises led to economic isolation from the rest of the world. There was no point in making wine for export, and few Argentines could afford to import top-rated French wines. The choice was plonk or nothing. By the time that changed, France was no longer the country’s oenological model. As Argentina’s economic barriers fell, a new wine power was rising: California. Europeans eventually enter Mount’s saga, but it’s primarily about the collaboration between Argentines with big ambitions and Americans with new ideas. They were the “mavericks” of Mount’s subtitle only in the sense of violating local standards of mediocrity. They set out to craft fresh, fruity, intense vintages of the sort already favored by such influential U.S. wine critics as Robert Parker Jr. 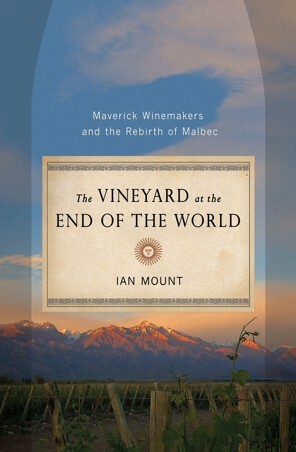 Despite its singular title, Mount’s book is not about a lone vineyard. He covers a 1,000-mile swath of the Andean foothills, from Salta in the north to Nequen in the south. But most of his characters toil near Mendoza, roughly due west of Buenos Aires. This is where the Catena family started making wine in 1902. Three generations later, in 1982, Nicolas Catena was an economics PhD on sabbatical at Berkeley. He had previously avoided American wines, but he decided to tour Napa. He was impressed by what he drank and by the openness of American winemakers. Soon he was hiring consultants from California, and he clicked with one of them, Paul Hobbs. The duo remade Catena’s operation so successfully that today — according to Mount — both want credit for the accomplishment. “The Vineyard at the End of the World” is occasionally repetitive, and Mount’s frequent movie analogies are distracting. So is his habit of introducing his characters by describing their distinctive facial hair, which has the unintended effect of making them all seem interchangeable. Mount doesn’t immerse the story in arcane matters of chemistry, and he touches only lightly on controversies about wine-industry globalization — leading, some argue, to a decline in subtle flavors and regional character. He’s written a book for people who are as interested in Argentina’s culture and history as its wine. That may disappoint Bacchus’ most zealous acolytes, but the casual drinker should find the result lively and well-balanced. Jenkins is a reviewer of film, arts, music and books. This entry was posted in General, TV, Video, Film on wine, Wine - Vino - Vinho and tagged argentina, malbec, simithsonian, video. Bookmark the permalink.